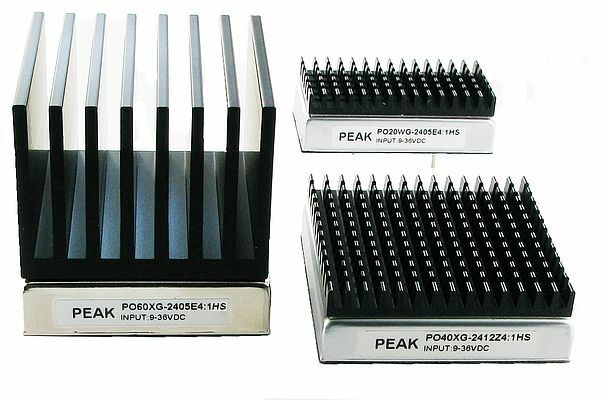 Peak electronics offers the PO/HS series of high power DC/DC converters with integrated heatsink. This avoids the necessity of separately ordering a suitable heatsink to remove the heat according to the needs of the application and the converter housing temperature is reduced. The heatsink, which is mounted directly on the converter package, is made of aluminum and, depending on the model, weighs an additional 16 g, 19 g or 128 g (without the converter). The converters range from 20-watt DC/DC converters housed in a 1 inch x 2 inch package to 60-watt DC/DC converters housed in a 2 inch x 2 inch package. All models are available with a wide 4:1 input voltage range of 9‑36 V or 18‑72 V. The converters deliver output voltages of optionally 1.8 V, 2.5 V, 3.3 V, 5 V, 12 V and 15 V. The series has an efficiency of 87% (typical). The most interesting features include output short circuit protection (hiccup, continuous & auto recovery), output overvoltage protection (clamp mode) and over-temperature protection. The input/output isolation is 1500 V DC (1.5 kV DC). The switching frequency is a constant 300 kHz (typical). The ambient operating temperature range is from -40°C to +85°C with derating. The main applications of the new series of DC/DC converters are battery powered equipment, instrumentation, telecommunication systems, wireless-controlled devices, transportation systems, industrial control systems and process control equipment.